I love that you are doing the absolute bare minimum to protect vulnerable tenants who are being fored out of the community by profit-hungry landlords and developers. But I am disappointed that you are getting way out of line with the way you are electing tenant right advocates to city council. I cant tell you how terrified I am that the people might gain equal representation in government. Our lawmakers should ideally be landlords or should be easily bought by homeowners. Regarding rental housing, I see the potential for rents to dramatically increase, for profits to multiply, and for tenants who cannot afford higher rents to just leave. 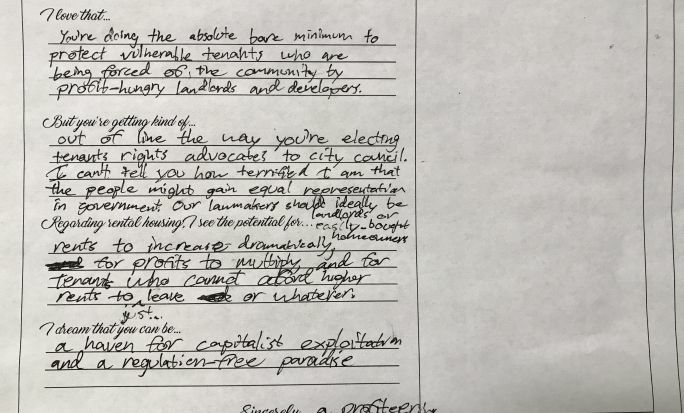 I dream that you can be a haven for capitalist exploitation and a regulation-free paradise.